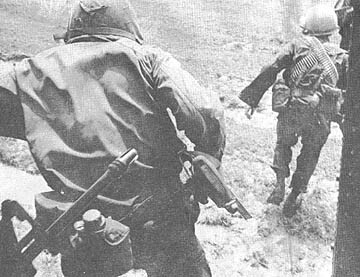 Viet Cong forces operating throughout Hau Nghia Province have been dealt three major setbacks by elements of the 25th Inf Div during the first five months of Operation "Kolekole," according to division officials. The Viet Cong paid heavily in men - 452 killed in battle actions and 464 more rallied under the Chieu Hoi program. It also cost them in the destruction of tons of munitions and underground factories that were being used to manufacture the munitions. Thirdly, they lost their hold - by terrorism - over the people. "We have crippled the Viet Cong so badly," says COL Edwin W. Emerson, 2d Bde commander, "that I doubt whether they'll ever recover their losses." Referring to the pacification program, he says, "We've strengthened the bond between the Vietnamese poeple and the Allied forces, that no amount of terrorism will break that bond." Since the start of Kolekole, enemy base camps, fortifications, supply routes and storage centers have been hit by daily helicopter combat assaults, ground search and destroy operations, artillery and 840 tons of bombs by air strikes. Emerson commented on the recent destruction of the Viet Cong munitions storage and manufacturing center along the Oriental River, 40 kms northwest of Saigon. "Large enemy forces infiltrating from the west were able to reach the river by traveling light and fast. The center provided food, clothing, medical supplies, grenades, booby traps and mines. From that point they would move out to their objectives." Early in the operation a base camp was uncovered not far from the storage center, which officials felt could house a multi-battalion size enemy force. LTC Chandler Goodnow, a battalion commander, estimated that, "The camp could easily support 600 to 700 enemy soldiers, and serve as a staging area for major guerrilla attacks in any part of the Hau Nghia-Saigon area." The pacification program, according to Emerson, received top priority because, "We had to increase the security for the people and at the same time give them an economic boost." The security is being provided by joint brigade and ARVN operations. The economic boost was supplied by the rebuilding of a two-lane highway and two bridges to make the markets in Saigon, Duc Hoa and Bao Trai readily accessible to farmers throughout the province. Civic action programs followed the brigade's combat elements throughout the operation. Emerson cited as an example, "Over 15,000 Vietnamese patients were treated by MEDCAP personnel during those first five months." COL William T. Gleason has become a new assistant division commander with the 25th Inf Div. He succeeds BG Robert C. Shaw, who has been assigned to duty in India. COL Gleason comes to the 25th from assignment as deputy assistant chief of staff, J-4, Military Assistance Command, Vietnam (MACV). A 1941 graduate of the U.S. Military Academy, he went on to graduate from the Command and General Staff College, the Armed Forces Staff College, and the Industrial College of the Armed Forces. A veteran of World War II and the Korean War, the colonel has received the Silver Star, Legion of Merit, and Bronze Star with oak leaf cluster. The colonel has been recommended for promotion to the rank of brigadier general. Btry A, 7th Bn, 11th Arty, became the first in the 25th Inf Div to execute a hip shoot - hasty occupation of position - when they answered a radio call from the 3rd Sqdn, 4th Cav, for emergency fire support. The battery was moving toward Cu Chi Base Camp on the road from Sudi Cao when the request came in. After receiving the message, CPT William Warnock, battery commander from Seymour, Conn., ordered the command element to speed up through the village of X An Duc and seek a suitable place to set up the unit's 105mm howitzers. The mission of finding a good emplacement site was given to SFC Tony Gonzales, Solana Beach, Calif., chief of firing battery. Meanwhile Warnock located the battery and the target on the map. In a matter of minutes Gonzales found what he was looking for and led the battery off the road and set up the howitzers. Firing charts were set up by PFC William Randolph, battery chart operator from Ashville. N.C. Working coolly and swiftly, he completed his task just three minutes after the call was received. The accomplishment drew praise from SP5 John Briar of Chicago, Ill., chief computer, as "the finest job I've seen yet." While the firing data was being compiled by Briar and 1LT Gary Pipkin, Boise, Idaho, the howitzers were bore sighted. This is not usually done on a hip shoot but Pipkin recalls that "the commander thought they should be bore sighted because of the heavy population in the area." A perimeter was set up by SGT William Jones, the battery ammunition sergeant from Lancaster, Pa., with organic weapons and two twin 40mm "dusters" which were attached. "We were in an open field," Jones recalls, "and the men were finding dud grenades all over the place. Not knowing how long we were going to stay in the position, and with no infantry to use on the perimeter, we were concerned about a ground attack." "When we heard that correction," relates SGT Allen Defies, Chicago, Ill., acting chief of section of the gun that fired the shot, "we knew we had fired a good first shot. It's hard to get that close to the target on the first shot even when you are set up in camp and have all the survey data." The battery fired 63 high explosive rounds before "end of mission" was given by the forward observer and the march to Cu Chi was resumed. Speaking of the mission, Warnock recalls that "when we first got there it was raining cats and dogs, we had no chow with us and I remember Gonzales saying when the call first came down 'it can't be true.' There is no question that the men's morale is high. After they found out what had happened they reacted with speed and so little confusion that I was really surprised. The result of the action was given by the cavalry air observer as "rounds on target." The Reverend James D. Ford, Chaplain to the Corps of Cadets, U.S. Military Academy at West Point, arrived at Camp Cu Chi Aug. 21 to begin a three day visit. Reverend Ford was here to observe the activities and responsibilities of Military Academy graduates assigned to the 25th Inf Div. Upon his arrival here he was met by Chaplain (LTC) John L. Barry, division chaplain. During his three-day visit Reverend Ford visited Div Arty, 125th Sig Bn, Spt Cmd, 1st Bde, 65th Engr Bn, 3d Bde, 3d Sgdn, 4th Cav, 2d Bde, and the 25th Avn Bn. sacrificed and endured, rests the national hope. 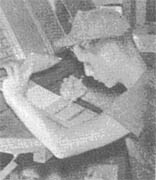 SSG Billy J. Anderson, HHC, 1st Bn (Mech), 5th Inf. Every soldier has, at one time or another, heard of the Red Cross Emergency Leave Program. But except for those who have actually been through the process, the complete details and benefits are mostly unknown. The following is a case history involving a 25th Inf Div soldier. It illustrates in detail all the steps in obtaining, taking and returning from emergency leave. At midnight on July 15, a car carrying the parents of Private First Class Mike O'Brien skids on a rain-swept highway in Arizona, and bangs into a tree. Mike's father is unhurt, but his mother is critically injured and is taken to the County Hospital. The doctors inform Mike's father of the seriousness of the injury and suggests that all immediate members of the family be notified. Mike's dad tells the doctor that his son is in Vietnam. At 1 a.m. the doctor notifies the local chapter of the Red Cross and verifies the seriousness of the situation. The local chapter representative obtains Mike's full name, rank, service number, and unit designation, then relays the message via the teletype to the American Red Cross National Headquarters in Washington, D.C. The message is logged in, then turned over to the Armed Forces Communication Service for overseas relay to Vietnam. At 5 a.m., just four hours after the Red Cross is notified, the message is received by wire at the 25th Div Communication Center, who in turn deliver it to the Div Red Cross Field Office. Usually the Red Cross field director delivers the message in person, but Mike is in the field, so the message is transmitted to his Unit Commander, who personally informs Mike of the Usually the Red Cross field director delivers the message in person, but Mike is in the field, so the message is transmitted to his Unit Commander, who personally informs Mike of the accident, then arranges for immediate transportation back to base camp. While Mike is making his way in from the field, the Red Cross informs the division Adjutant General Personnel Action Branch, who after verifying the fact that it is an immediate family member who is seriously injured, cut travel orders for Mike. As soon as they get the OK from AG, the Red Cross sends a message back to the states, informing Mike's family that he is on the way. Mike cleans up and packs, then reports to AG to receive 30 day emergency leave orders. If he needs money, he draws a maximum partial pay from finance and or an Emergency Leave Loan from the Red Cross. He then goes to G-1 who have already arranged for helicopter transportation to Bien Hoa and the 90th Repl Det there. At seven a.m. Mike is boarding the first available plane for the states. He travels on a priority space-required basis. At 3 a.m. the following morning, Mike arrives at Travis AFB in California. He checks in with the Army Transportation Coordinator in the terminal, at which time his 30-day leave officially begins. Mike is now on his own. He can try to get a military flight to the AFB nearest his home town. If none are available, he can make reserved-seat reservations on any commercial airlines at military rates (1/3 off regular price). There are no military flights available so Mikes uses the funds from the Red Cross loan to purchase a commercial airlines ticket. Mike arrives home two hours later, just 30 hours after the accident. He stays home while his mother is recuperating, but just as his leave is about over, she takes a turn for the worse. The doctor recommends that Mike stay another week, and makes that request through the local Red Cross chapter. Following the same procedure as the first message, the request for leave extension is relayed to the 25th Inf Div AG. They approve Mike's extension, and air-mail his new orders to him. During the next few days Mike's mother improves a great deal, and the doctor says she'll be OK. Mike now prepares to return to duty, but doesn't have enough money for the plane fare to Travis. He reports to the nearest military installation, and receives a casual pay that allows him to buy the ticket. The next day he reports to Travis, and his leave ends. Because he is traveling TDY, he is booked on the next available flight to Vietnam. A day later he arrives at Tan Son Nhut and reports to the 90th Repl Det, who arrange military transportation for him back to his unit. An hour later Mike returns to Cu Chi, and prepares to return to duty. This story is typical, and shows exactly how the Red Cross Emergency Leave Program works. The emergency leave that Mike took DOES count against regular leave time. However, if he had already used up his leave, he could still go on emergency leave, but must either make up the days, or if his ETS is too close, pay the Army for the month he took off. If you have any questions concerning the Emergency Leave Program, contact the 25th Inf Div Red Cross Field Office. Overall enlisted promotion opportunities today in the armed forces are the best in the history of the Defense Department, Assistant Secretary of Defense (Manpower) Thomas D. Morris testified Aug. 2 before the House Armed Services Committee. He said 970,300 promotions in grades E-4 through E-9 are projected for FY68, with more than 85 per cent earmarked for E-4 and E-5 grades. These hikes are slated, he said, within the all-service FY68 force structure of 1,760,000 non-commissioned officers and NCO-grade technicians. Secretary Morris forecasts 568,800 promotions ranging from E-4 to E-9 for the Army; 192,500 Navy, 149,900 Air Force and 59,100 Marine Corps. * DOD believes it best for each service to determine its own annual promotion requirements and capability. * DOD plans, however, a future objective for each service to forecast annually its own promotion picture for five years. Army's rapid Vietnam buildup and draft dependence forces Army to train and promote faster, particularly to E-4 and E-5. The primary mission of signal units attached directly to major tactical forces in Vietnam is providing the commander in the field with direct immediate communication with his superiors at Headquarters and subordinates at their positions. Without this type of communications, the coordination necessary to meet the lightning fast changes in conditions of this unique war would not be possible. To allow tactical signal units to devote their full efforts to this most important assignment, units of the 1st Sig Bde (USA STRATCOM) are providing base camp communications at many headquarters sites in Vietnam. One of the largest such support operations is manned by the 86th Sig. Bn., under the command of LTC Walter G. Ellis. His organization supplies the administrative telephone hookups for the combat and support units stationed at Cu Chi, home of the 25th Inf Div. 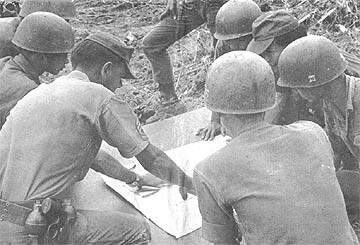 In addition, smaller elements of his command are deployed to Tay Ninh, Duc Hoa, and Dau Tieng with numerous platoons and smaller detachments situated throughout the western section of the II Corps area. Each of these units has a mission requirement which makes it unique in some way, but the massive base camp communications set up at Cu Chi give an example of the importance and complexity of such operations. 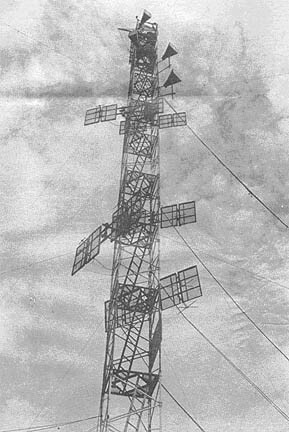 The end product of this work by the Army's signalmen is the array of signals which pour from the top of a 106 feet tall UHF/VHF tower located at one edge of the 86th's real estate. All of the transmissions are line of sight "shots" connecting the Cu Chi and Lightning switchboards with Saigon and other major military installations within the south-central portion of Vietnam. Including the systems operated by the 25th Div, there are a total of 17 VHF/UHF systems, providing both voice and teletype trunking facilities, which emanate from Cu Chi. 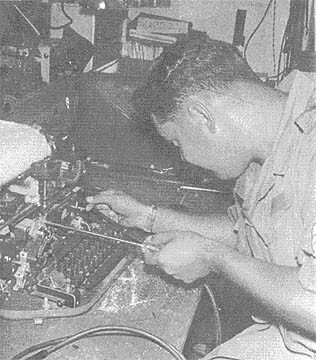 The addition of the 86th operated Cu Chi switchboard early in 1967 has also given the 25th and their Lightning switchboard direct entrance into the long-distance worldwide communications network operated by 1st Sig Bde. The importance of the 86th's contribution to the smooth running of the 25th Div is outlined by 1LT Robert F. Berdan, of Fairfax, Minn., the 25th Div wire officer. "The take-over of base camp communications by the Cu Chi switchboard has allowed our own Lightning swithchboard to become even more responsive to the division's tactical requirements," he says. 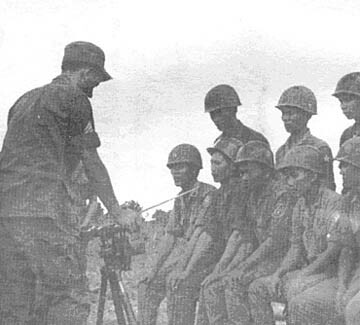 Before the 86th arrived, those signalmen who were not deployed to the field with combat units were given the added responsibility of keeping the huge population of the Cu Chi complex in communication with both distant points and adjoining units. Under the current setup, signal units coming in from the field from an operation can use time at base camp to conduct necessary preventive maintenance and to clean their equipment so that they can be at maximum efficiency at all times in the all important tactical situations. Coordination of the administrative details of the hookups is provided by the 25th in a cooperative effort which both groups say has worked to the satisfaction of all concerned. Work orders for all new telephones on the post are submitted to the Div Sig Officer LTC Louis G. Mathern Jr., and when approved by him are forwarded to OTC Ellis for installation or other necessary implementation. The cut over from a tactical communications setup to a fixed plant operation was accomplished on May 14, 1967. The 36 hour operation earned for the 86th a letter of commendation from MG John C.F. Tillson III, then CG of the 25th. He congratulated them for "their technical competency and professional leadership." He further recognized "that careful planning and long hours of work were expended to accomplish this task which is indicative of the overall signal support rendered" by the 86th. The 507 subscribers at Cu Chi are served with 40 long distance and 77 local trunks. A recent week saw 29,598 local calls placed on the equipment and another 25,812 trunk calls. Most calls to the switchboard are answered in one to four seconds at the nine position MTC-9 switchboard. Supervising 30 operators, whom he calls "the best in the country," is SSG McKinley R. Roberts of Alexandria, Va. Local calls can be handled in less than five seconds from the sandbagged van surrounded with Roberts' poppies and geranium plants. The switchboard is manned 24 hours a day with a minimum of five men overnight and as many as 11 during the peak hours. At the Cu Chi wirehead, worked by other members of Co B, 3714 pairs of wires are terminated. When fully utilized 4020 pairs may be handled. Efforts to keep all of the battalion's lines in operation are centered in Bn Control (BATCON), 1LT James C. Burdette of Sioux Falls, S. D., and SSG John H. Hopewell of Lorain, Ohio, explain that inside the two vans that house the installation are several teletypes and telephones over which immediate reports of circuit outages are transmitted. As soon as trouble is reported, the 86th BATCON makes sure that repair teams have been dispatched and then reports the trouble by teletype to the 2d Sig Gp Hqs at Long Binh, where corrective action will be coordinated. In addition to switchboard facilities and entrance into the long distance worldwide communications network, the Cu Chi Base Camp operation of the 86th also provides over-the-counter services to the various support groups that are located at Cu Chi. Pilots can learn what flying weather is throughout the country via circuits provided by the 86th. In addition, equipment operated by the 86th has the capability of "going tactical" when the need arises. During Operation "Attleboro," circuits to Saigon were pre-empted to provide tactical units of the 25th additional means of contact with Saigon. In Operation "Manhattan," the 86th was tasked with providing secure teletype circuits. PFC Robert White of B Co, 86th Sig Bn, makes a cross-check in the stock files of the 587th Sig Co. Stocks from both companies are used to operate the 86th Sig Bn's electronic maintenance section. The 25th Inf Div's 1st Bde launched a six-week refresher training schedule for the 1st, 7th Regt, 5th ARVN Div, on Aug. 15. An impressive morning ceremony at Phu Hoa Dong signalled the start of the program. BG Phan Quoc Thuam, commander of the 5th ARVN Div, and BG Donnelly P. Bolton, assistant "Tropic Lightning" division commander, were both on hand to kick off the first major program of this kind in the division. The 1st Bde's Mobile Training Team (MTT), composed of two officers and 16 non-commissioned officer instructors, set up a joint training plan which emphasizes the techniques of leadership. Also covered will be staff procedures, fire and maneuver, night operations, extended field operations, airmobile operations and the use of supporting fires. All units in the battalion will participate from the squad to battalion level. A three-day Army Training Test (ATT) will top off the training. The combat-hardened ARVN's have worked with the 1st Bde in many joint operations. 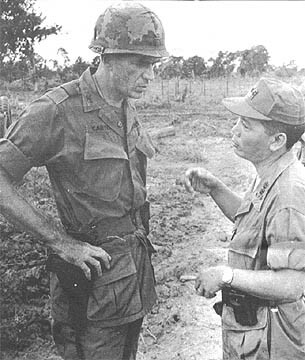 However, a need exists for an exchange of ideas on tactical principles and techniques, according to COL Robert Sonstelie, the senior advisor with the 5th ARVN Div. Phu Hoa Dong, Hau Nghia Province, was picked for the site of the initial program because it is the new home of the 1st Bn, 7th ARVN Regt. This battalion, commanded by Maj Pham Be, was a major maneuver force in the recent pacification of Phu Hoa Dong one of the most important pacification efforts conducted in III Corps zone. On completion of the joint training, the ARVN regiment will remain in Phu Hoa Dong to provide local security and to provide highly skilled maneuver forces to the 1st Bde for the many "buddy" operations conducted in this area. COL Doniphan Carter, 1st Bde commander, is a firm believer in this joint training venture. He said, "This training will be mutually beneficial to the ARVN and American Soldiers. Each has something to pass on to the other. We have conducted joint operations in the past, we know each other's particular strengths, and we have developed a training program to take advantage of that knowledge." 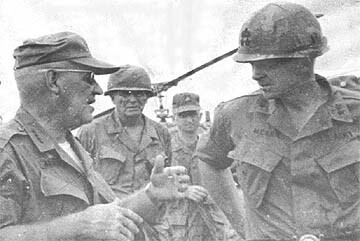 Carter went on to say, "I have selected officers and noncommissioned officers to conduct this training who are experienced instructors and who know and understand the ARVN soldier. I am confident that the results will be of great benefit to all." In the afternoon of the opening day, training was observed by GEN Creighton Abrams, deputy MACV commander and MG F.K. Mearns, 25th Div CG. A small Viet Cong force west of Saigon recently joined the 25th Inf Div's "Wolfhounds" in supporting the Osaka Orphanage in southern Japan. The contribution took place after a short but furious firefight between the estimated squad and elements of the 1st Bn, 27th Inf. The U.S. soldiers overran the enemy position after an aerial combat assault, killing several VC guerrillas. When intelligence officers examined papers found at the site they discovered an enemy payroll containing a large roll of Vietnamese money. After a few moments discussion, the "Tropic Lightning" soldiers, who have supported the orphanage since the end of World War II, decided to give the VC a chance to do their part. DAU TIENG - SP4 Steve Hilton of High Point, N.C., who led his marksmanship class in basic training, killed one and captured 11 other members of a VC medical detachment in the jungles 12 kms south of Dau Tieng recently. As the 3d Bn, 22d Inf, swept in by helicopter to surround the village of Thanh An, Hilton and members of the Recon Plt took up blocking positions in the rice paddies. On request of the helicopter gunships who had checked the area for VC, two squads went into the jungle. Hilton, on point, turned a corner in the trail to see several bags resting at the base at a tree: then one VC popped his head out of a bunker. Hilton snapped off a shot, killing him instantly. He fired twice more into the entrance and then tossed in a grenade preparatory to making a search. Eleven VC came out to surrender. A quantity of medical supplies were seized in the bunker along with an M-1 and a Russian AK-47 assault rifle. The captured VC were part of the medical section of the 83d Rear Support Group which supplies the enemy units in War Zone C.
LTC Fremont B. Hodson Jr. of Atlanta, Ga., recently became the new executive officer of the 25th Inf Div's 2d Bde. He succeeds LTC Ted Gordinier who was reassigned to division headquarters as assistant chief of staff. Hodson's last assignment prior to arrival in Vietnam was in the Republic of China as secretary of the joint staff, MAAG. He is a 1945 OCS graduate and served with the 7th Inf Div in Korea, as a Reserve advisor in San Diego, and in Hqs 2d Inf Div. He is a graduate of the University of Omaha, the Infantry Advanced Course, the Armed Forces Staff College, and the Command and General Staff College. Hodson holds the Silver Star, the Legion of Merit, the Bronze Star with "V" Device, and the Army Commendation Medal with two oak leaf clusters. An armored personnel carrier driver from the 25th Inf Div's 1st Bn (Mech), 5th Inf, was graduated Number One in the Div's Lightning Combat Leaders Course. In the process he set the second highest overall score in the history of the school. SP4 Alan J. Mulree of Covina, Calif., scored 649 points out of a possible 725 in the week-long course that emphasizes combat leadership skills and thorough knowledge of individual weapons. A new "Wolfhound" soldier got a rousing welcome from an old one recently in Hawaii when SSG Melvin Johnson of Lawton, Okla., met the founder of the world famed Wolfhound Orphanage of Osaka, Japan. Johnson flew to Hawaii on Rest and Recuperation from his duties with the 1st Bn, 27th Inf, part of the 25th Inf Div. "I visited the orphanage earlier this year," he said, "and I thought Hugh O'Reilly would like to see the pictures we took." 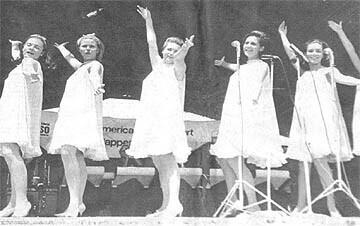 O'Reilly founded the orphanage soon after World War II. When the former master sergeant, now the vice-president of a large Hawaiian bank, heard that a fellow Wolfhound from Vietnam was in Hawaii, he registered him in one of Honolulu's best hotels and gave him a complete tour of the city. Johnson's wife arrived the next day and the couple joined O'Reilly and his wife. "They wanted to hear all we could tell them about the unit back in Cu Chi and the orphanage in Osaka," said Johnson. "When we left he told us that he'd be very happy to meet any other members of the 27th on R & R," the soldier said. Since its beginning nearly twenty years ago, the orphanage had grown to be considered one of the best in the Far East. DAU TIENG - In the recent helicopter assault on Thahn An Village, 12 kms south of Dau Tieng along the Saigon River, LT Donald Haas of the 3d Bn, 22d Inf, shot a VC, and nearly, as often happens, never knew it. The 3d Bde, 25th Div, operation was designed to capture resident VC in a cordon by the infantry units on three sides of the village while the fourth side would be covered by "gunship helicopters. Sweeping into the village Haas saw a VC streaking for a jungle about fifty meters away. He raised his AR-15 and fired several shots before the VC plunged into the trees, sure that he had missed. The third platoon sergeant on a patrol later found the man's body 150 meters out on a trail. The early morning air still held some moisture from the previous night's rain as the patrol moved out of Tan Phu Trung under a moonless sky. The force, composed of troopers from the 2d Bn, 14th Inf, and Vietnamese soldiers from Regional Force, Popular Force and Regular Army units, were going out to set up a night ambush in the "Clover Leaf" area south of the 25th Div's Cu Chi base camp. The first few kilometers were easy going as they moved along Highway 1 toward Saigon. However, this didn't last long as 1LT Charles E. Chrosniak Jr., of Johnson City, Tenn., led the patrol off the highway and into the extensive rice paddies that dominate the terrain in that area. After two hours of wading through the paddies and trying to walk along the dikes separating them, the patrol reached its ambush site and set up a position designed to trap any Viet Cong that might move through that area. Intelligence reports had indicated that not less than a VC squad was active in the region. Their vigil was fruitless though and at dawn the patrol left the ambush to perform the second half of their mission, a sweep of the area north to the village of Vinh Cu. Again, no contact was made with "Charlie" although much evidence was found of his activities in the area. During the sweep the Vietnamese and American troopers discovered 600 meters of tunnel complexes, blew up 52 tunnel entrances and destroyed two bunkers and numerous booby traps. The discoveries exceeded all expectations and the patrol had to be resupplied around noon with more Composition-4, blasting caps and fragmentation and smoke grenades. 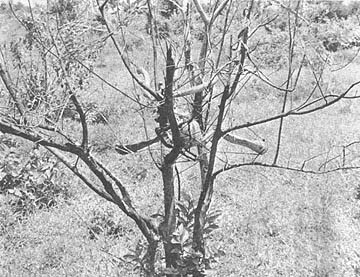 BOOBY TRAP - One of the booby traps the patrol discovered as they swept an area near Cu Chi. 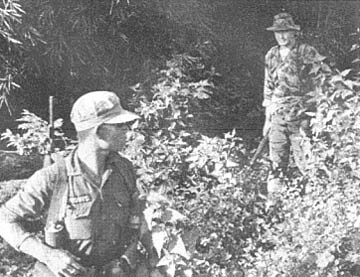 AREA SWEEP - An ARVN soldier and SP4 Dennis M. Swan of Miami Beach, Fla., a member of Co B, 2d Bn, 14th Inf, emerge from the jungle into an open area as the patrol sweeps the "Clover Leaf" area. 37 kms northwest of Saigon. DAU TIENG - The alertness of two soldiers of the 3d Bde, 25th Inf Div, netted a crafty VC tax collector recently during a lightning fast raid on Thanh An Village, 12 kms south of Dau Tieng. Sp4 James Hipps of Greenback, Tenn., and SP4 Mark Delong of Owen, Wisc., felt left out as other members of the 3d Bn, 22d Inf, searched the village. They were placed as guards at the edge of a rice paddy. "Say, I think I see something," said Delong. "It's a man all right," said Hipps, looking through a pair of binoculars which brought the head and shoulders of a Vietnamese 400 meters away in the rice paddies up close. As armed helicopters swept in over the paddies, the man disappeared behind a dike, only to reappear again after a short interval. Once the VC got up to shoo some dogs away. The two guided a squad patrol out and found the man stretched out beside a dike. DAU TIENG - When the nightly ambush patrol leaves the 3d Bn, 22d Inf, lines at Dau Tieng each evening, it's a mixed bag indeed - representative of every contingent in the battalion. Along with the ubiquitous medic may go a truck driver, a 4.2 mortar man, an operations clerk, a mechanic or radio repairman, or any of the multiple trades which make the modern infantry battalion function. It's a training mission for new replacements and the last time out for the old. While the main infantry elements are on missions far afield, the ambush patrols carried on by these "instant" units are vital in the security of the "Tropic Lightning's" third brigade base camp. "Everytime Miss Karen II gets hit I wonder if there is something on her that could be making Charlie mad," stated SP4 Robert D. Chisholm of Albuquerque, N.M., the driver of the company commander's track, 4th Bn (Mech), 23d Inf. It seems that every time the CO's track goes on a mission it is singled out from the rest and zeroed in on. Miss Karen I was stopped by a 105mm artillery round that Charlie had fixed up as a mine when she had 495 miles on the speedometer. The following week Miss Karen II ran over a mine that had been placed in the road but only the blasting cap went off, the rest of the mine did not detonate. The mileage again was 495. The next time the track was hit was on a search and destroy mission in the Boi Loi Woods. Five tracks had gone past when "BANG," Miss Karen II was blasted by a claymore mine and grenades and she went back to the shop for repairs. When civil affairs soldiers of the 25th Inf Div's 2d Bde recently began distributing colorful shorts to the children of Hau Nghia Province they nearly turned one small hamlet into a nudist colony. CPT Albert Amos of Mobile, Ala., tells how the first thing he noticed in Vietnam was how many little kids run around without clothes. Amos sent back to the states for hundreds of brightly colored shorts. Problems arose almost immediately. "We couldn't figure out how to distribute them," he said, "so we just walked down the street in Loc Thanh, a nearby hamlet, and started putting shorts on every bare kid we spotted. They made a big hit and we ran out in minutes." Returning the next morning with what he figured was enough for a full day, he and his two assistants were swamped with clothesless children. "As soon as they saw us coming," he said, "they ran behind a building or a bush, pulled off all their clothes, and ran back for shorts." The day's supply ran out in the first hour and the three bewildered soldiers returned to their base camp exhausted. "I'm still sure it was basically a good idea," says Amos, "we'll just have to approach it a little differently next time." A 25th Inf Div soldier caught in a night mortar attack at a forward base camp, figures his timing was perfect, but he still shakes a little when he tells the story. 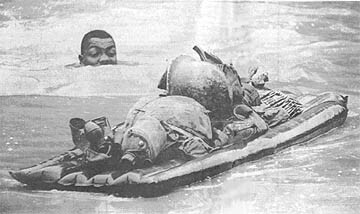 PFC Nathaniel Morris of Salisbury, N.C., in charge of the shower and water point at the 1st Bn (Mech), 5th Inf, combat base, says he was just laying there thinking about home when the first Viet Cong rounds fell into the camp. "Before I could run for the bunker the mortars began falling all around my tent," said Morris, " and I couldn't move so I just made myself as flat as possible." After a few minutes the attack let up and Morris scrambled for the nearest bunker. "Somehow I felt it was time to move," he said. The attack ended minutes later but he spent the night in the sandbagged position. Returning to his tent the next morning he found it shredded by shrapnel and stared at a crater just two feet from where his head had pressed into the dirt before he ran for the bunker. "I was scared during the attack," he admitted, "but when I saw where that round exploded I really started shaking."